[AUTO](RC):During your battle phase, when this unit becomes [Stand], this unit gets [Power]+3000 until end of turn. Dancing Wolf is one of the more unique support units of Nova Grapplers. With an ever so reliable 7K base and an interesting skill, it shows both promise and a surprising bit of confusion to many who come across it. Conventionally, Wolf is often paired with Stern Blaukluger, and with amazing results. Due to how Stern Blaukluger works, Wolf can often confirm that the second hit will always hit 11K and less Vanguards with the same or even greater amount of power than the first swing, spelling out a subtle death sentence or horrible damage rush should Stern get through while boosted by Dancing Wolf. To put it short, in conjunction with Stern, a single strike can nearly destroy any opponent right on the spot. Of course though, conventional uses are great but often put a limiting perspective on a unit at hand, especially Dancing Wolf, and here’s where I start digging into some of the weirder rulings in Cardfight Vanguard. When you boost with a unit, the boost is continuous throughout the attack. This means that if the unit is somehow lost halfway through the attack, like Pellinore uses its skill, that boosters power is also loss. This also means that if the boosting unit gains power halfway through an attack, that power gain is also applied to the entire column. And guess what happens when you drop a Stand Trigger on a Dancing Wolf. This is actually one of the more surprising tricks in Vanguard. Essentially, bringing Stern back into this at 11K base, the attack will hit for 18K. The opponent guards for a 2 to pass, 15K shield on top of his 10K Vanguard for 25K in total. With a single Stand Trigger, you can apply the 5K to Stern, and Stand Dancing Wolf for an extra 3K power, creating 26K in total. To sum up, what this basically means is that Dancing Wolf can essentially be used to break 2 trigger passes with a single Stand Trigger. An overly cautious player can end up over predicting against this combo, dropping 20K shields for what should normally be a no pass, totally burning out their hand in a far higher rate than normal in the process. To put it simply, Nova Grappler players, here is your illusive 10K booster, complete with a gimmicky ruling and the ability to blast straight through unaware player’s shielding. Of course, this card has other uses than ultimate enforcement behind Stern or a slightly cheating 10K booster, where it exists in your Rear-Guard columns. Let’s say you have a Dancing Wolf boosted by a Tough Boy against a 10K Vanguard, or virtually any booster behind a Dancing Wolf vs MLB or a Cross-Ride. Once again with a Stand trigger, or Asura Kaiser fueled shenanigans, one can Re-Stand Dancing Wolf into a 10 or 15K pseudo beater, meaning an extra attack to lay more damage on the opponent, or pester or even kill off their Rear-Guard beaters. There are many more intricate combos with other Nova Grappler Vanguards-combos I hope I could cover with those units. 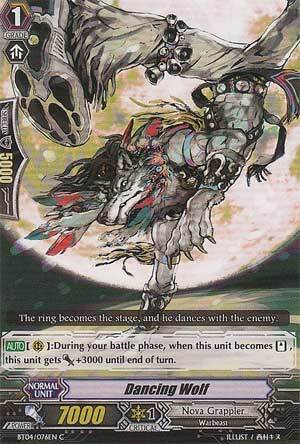 Until then though, Dancing Wolf as a card pulls out a solid 3.5 out of 5 from me. Nothing amazing, but its reliability as a 7K booster that can act as a 10K booster or 10K pseudo beater, and its ability to break 2 trigger passes on unsuspecting opponents makes it more than a decent enough card.